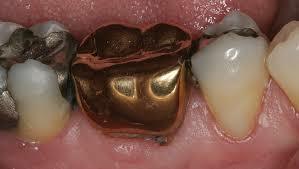 This week we’re examining a dream about a gold crown on a tooth. In the dream, the crown came loose. It’s a short dream, and I’m using the extra space to review the techniques of dream interpretation. If you look carefully at that last comment, you see that it could refer to something other than teeth. Metaphorically, clearing away debris can refer to almost anything. It’s not only a reference to physical debris, but it could also be commenting on a lifestyle, or an attitude, or congestion of any sort. That broader way of understanding the symbol was what we were looking for. Now it was time to reassemble the dream to turn it into a metaphoric commentary. To do this, we remove all of the original symbols, and in their place, we substitute the dreamer’s own comments about each one. Additionally, I continually insert little phrases such as, “there is a part of me” to remind the dreamer that all facets of the dream imagery represent a part of himself. There is a part of me I use to prepare what I take in, in order to stay alive and to give me the nutrition and energy I need to stay healthy, strong and enthusiastic about life. I use this part of me to reduce my nutritional intake to a manageable size. At the moment, I’m clearing away stuck debris. I feel no stress or urgency, just peace. I’m using a part of me that’s like a spear that you use to push unwanted nutritional debris away. I’m working on the area where I chew my nutrition and really break it down into tiny pieces. I have the sense that this area is back down in a hidden corner. Maybe easy to overlook. There’s also a part of me here that is a protective surface that gives a worn area new life. That way, I can continue to use the area long after its productive life is over. Really, the protective surface is like something royalty is entitled to. It’s the richest kind of covering I can have. But it came loose. It didn’t rigidly resist the way it is supposed to. This coming loose action could be dramatic and surprising. It might cause consternation. Instead, the movement was subtle. And the whole time I was thinking to myself, “I need to visit the doctor in me who can repair this. It might entail a minor fix, not much of an ordeal. Or it could mean a complete rebuild with some stress and unpleasantness. As you read the revised dream, the first two sentences seem a bit cumbersome. But with careful attention, their message becomes clear. Then, the rest of the dream delivers a succinct, direct message. Tomorrow, we’ll ask the dreamer for his thoughts.